This is a good Mexican style breakfast with all the essentials: Eggs, hashbrowns, chorizo, and beans. Place the hashbrowns in a large bowl and add about ½ cup of grated cheese. Mix together. Using a standard 12-muffin tin, fill each hole loosely with hashbrowns. Using fingers, press the hashbrowns in each hole around the sides and bottom of the hole, forming a little cup. While the hashbrown cups are baking, brown the chorizo in a skillet. Whip the 6 eggs in a pourable container or large measuring cup. Add salt and papper when whipping. 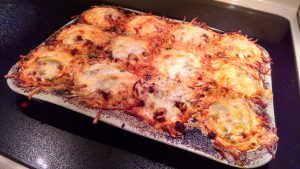 After the hashbrowns have baked, remove them from the oven. In each cup, place about a teaspoon of refried beans, smashed with a spoon into the bottom of the cup. Put a spoonful of chorizo in each cup.